The E10 Corolla was the first car launched under that name in 1966. Toyota used lessons from the not entirely successful Toyota Publica, which was just a little too spartan for most people. The Publica lived on as Toyota’s domestic price buster, but the Corolla went on to become their most successful car - and is still going strong today. According to Wikipedia, “floor shift transmissions were considered only for trucks and 4 speeds implied that the engine did not have enough torque to drive through only three gears. This was a big risk for Toyota but the effectiveness of the new system gained in popularity.” I can’t say that I ever saw it this way, but this was even before my time, so who knows. These two little TLV beauties come from an ebay seller who also happens to be a member here - and he certainly offered a great deal and great service - I was more than happy with the deal. As you can see, I opted for the Police and JAF liveries on these. On the whole, I prefer civilian versions, but I do love both a Japanese Police car and a JAF livery - I just like the way they look. Australia became the first export market for the Corolla, and it has become a staple of our local motoring scene - as well as a by-word for reliable, affordable cars. The E10 series lived on until 1970, and was followed by, well, every other Corolla since. 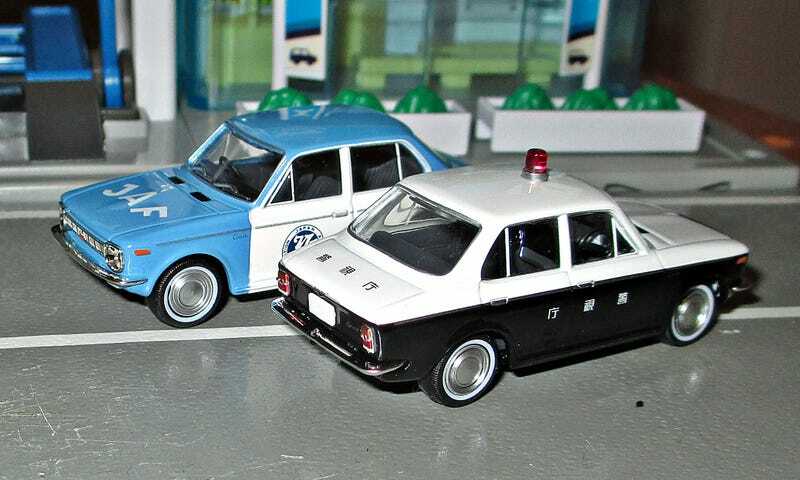 As Tomica models only appeared in 1970, Tomica didn’t get to put an E10 into their original line-up. A model of the E20 Sprinter became the first of many Tomica Corollas. TLV have since made both 2-door and 4-door versions of the E10 sedan - we’re still waiting for the Sprinter though!